Installation is fast and easy. No CD required. Three bands that deliver the fastest combined Wi-Fi speeds to more devices. Latest Wireless-AC technology for simultaneously streaming and gaming on multiple devices. Experience powerful Wi-Fi coverage throughout a large house. Four streams of data for stronger, faster performance when gaming and streaming. Safeguard your network with wireless WPA2 encryption and an SPI firewall. Create a guest network with a unique password for convenient and secure guest access using Linksys Smart Wi-Fi. Compatible with Mac and PC devices. Optimizes performance by focusing wireless signal to connected devices. Designed as a dual-purpose home office and entertainment Wi-Fi router, the MAX-STREAM AC5400 MU-MIMO Gigabit Wi-Fi Router (EA9500) delivers Wi-Fi to multiple users on multiple devices at the same time and same speed. Featuring MU-MIMO (Multi-User, Multiple-Input, Multiple-Output) technology, this Next-Gen AC Router treats your devices--PCs, Smart TVs, streaming devices, smartphones--as if each has its own dedicated router. Working in your home office, you'll enjoy lag-free videoconferencing and fast file transfer, even while the rest of the family is streaming 4K or HD media in the living room. The MAX-STREAM AC5400 MU-MIMO Gigabit Wi-Fi Router (EA9500) offers Seamless Roaming as you move around your home when linked with a MAX-STREAM Range Extender. With Seamless Roaming, your enabled wireless devices will automatically switch to the strongest Wi-Fi signal, so you won't have to manually connect to the router or range extender when you move from one room to another--or even to your garden. ** This means that you can move freely throughout your home while video chatting or streaming videos without experiencing dropped calls or buffering. Pair a MAX-STREAM range extender such as the RE7000 with the AC5400 for more efficient home Wi-Fi that delivers stronger, more powerful Wi-Fi signal to all your devices. With its ability to perform double duty as a home office and entertainment router, the AC5400 merits a premium level of support. For this reason, it's backed not only by a three-year warranty, but also by a three-year tech support guarantee. If you're working in your home office, you can quickly download large files thanks to the MAX-STREAM's 1.4 GHz dual-core processor, which delivers the performance necessary for seamless videoconferencing and fast file transfer. The AC5400 is capable of handling multiple high-speed data streams at once--delivering faster Wi-Fi speeds to more devices. With the MAX-STREAM AC5400 MU-MIMO Gigabit Wi-Fi Router (EA9500), your work files, data, and home network information are safely connected with WPA/WPA2 encryption and an SPI firewall. The MAX-STREAM AC5400 offers three independent Wi-Fi bands that deliver extremely fast combined speeds of up to 5.3 Gbps. * Tri-Band technology delivers up to double the Wireless-AC performance of a dual-band router. High-bandwidth applications like videoconferencing and movie streaming are ideal for the two high-speed 5 GHz bands, while lower-bandwidth devices like older wireless-N and -G computers can utilize the 2.4 GHz band. The router features eight adjustable external antennas, which can be positioned for optimal performance. They provide powerful streams of data to your devices, ensuring complete Wi-Fi coverage throughout your home. Unlike the two or three data streams found on other routers, the AC5400 delivers four simultaneous streams per band for stronger, faster performance. Play video games, listen to music, check email, shop, stream movies, and more--without having to worry about signal drop-off. 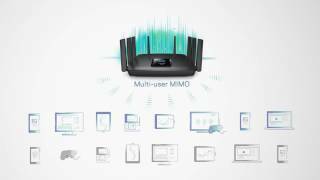 Beamforming technology directs Wi-Fi signals to each of your mobile devices. This focused direction provides increased signal strength and coverage. Eight Gigabit Ethernet ports let you connect an array of wired devices for enhanced file transfer speeds and stability--up to 10x faster than Fast Ethernet. Two USB connections--including one fast USB 3.0 port--are ideal for connecting shared storage devices or printers. "Fantastic performance, huge capacity for devices, great features and a solid control panel. A worthy winner of our Performance Award." "The EA9500 is certainly a formidable device and makes it to the shortlist for anyone wanting the latest and greatest home router." *The standard transmission rates–1000 Mbps or 2166 Mbps (for 5 GHz), 1000 Mbps (for 2.4 GHz), 54 Mbps, and 11 Mbps–are the physical data rates. Actual data throughput will be lower and may depend on the mix of wireless products used and external factors. **Seamless Roaming is designed for devices that support the 802.11k standard including but not limited to iPhone (4s and later), iPad Pro, iPad Air and later, iPad mini and later, iPad (3rd generation and later), iPod touch (5th generation and later), Samsung S4 (Android 4.2.2 /4.4.2), Samsung S5 (Android 4.4.2), and Samsung S6 (Android 5.0.2). For more information on supported Windows® and other devices, please check with your device manufacturer. Seamless Roaming may require the latest Max-Stream firmware. 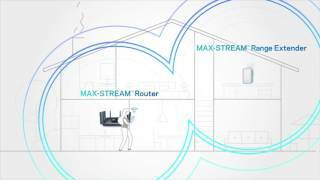 Please check the support page of your Max-Stream router for more details.